This week on the show, we’ve got some great stories to bring you, a look at the odder side of UNIX history from Ritchie, news about Wayland/Weston, a new ‘syspatch’ binary patch tool & more! Stay tuned for your place to B…SD! syspatch(8), a “binary” patch system for -release is now ready for early testing. This does not use binary diffing to update the system, but regular signed tarballs containing the updated files (ala installer). I would appreciate feedback on the tool. But please send it directly to me, there’s no need to pollute the list. This is obviously WIP and the tool may or may not change in drastic ways. 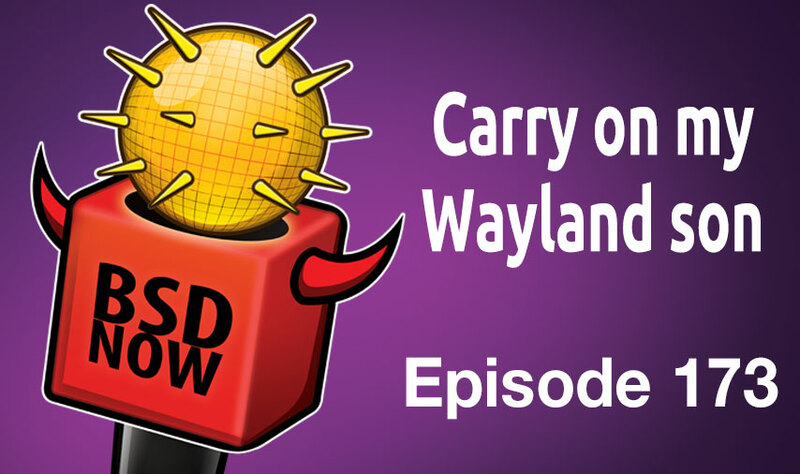 Over the past few years we’ve had some user-interest in the state of Wayland / Weston on FreeBSD. In the past day or so, Johannes Lundberg has sent in a progress report to the FreeBSD mailing lists. 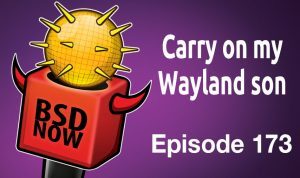 We had some progress with Wayland that we’d like to share. launching X11 app from Weston. Most likely problem with Weston IPC. Halted – depends on logind. Johannes goes on to give instructions on how / where you can fetch their WiP and do your own testing. At the moment you’ll need Matt Macy’s newer Intel video work, as well as their ports tree which includes all the necessary software bits. Before anybody asks, yes we are watching this for TrueOS! Continuing with our story from Brian Everly from a week ago, we have an update today on the process to dual-boot OpenBSD with Arch Linux. As we last left off, Arch was up and running on the laptop, but some quirks in the hardware meant OpenBSD would take a bit longer. With those issues resolved and the HD seen again, the next issue that reared its head was OpenBSD not seeing the partition tables on the disk. After much frustration, it was time to nuke and pave, starting with OpenBSD first this time. After a successful GPT partitioning and install of OpenBSD, he went back to installing Arch, and then the story got more interesting. After confirming through several additional re-installs that the behavior was reproducible, he then decided to go full on crazy,and partition with MBR. That in and of itself was a challenge, since as he mentions, not many people dual-boot OpenBSD with Linux on MBR, especially using luks and lvm! If you want to see the details on how that was done, check it out. Take note here, if you run into issues like this with any OS, be sure to document in detail what happened so developers can explore solutions to the issue. Do you have any Apple users in your life? Perhaps you run FreeBSD for ZFS somewhere else in the house or office. Well today we have a blog post from Mark Felder which shows how you can use FreeBSD as a time-capsule for your OSX systems. The setup is quite simple, to get started you’ll need packages for netatalk3 and avahi-app for service discovery. Next up will be your AFP configuration. He helpfully provides a nice example that you should be able to just cut-n-paste. Be sure to check the hosts allow lines and adjust to fit your network. Also of note will be the backup location and valid users to adjust. A little easier should be the avahi setup, which can be a straight copy-n-paste from the site, which will perform the service advertisements. The final piece is just enabling specific services in /etc/rc.conf and either starting them by hand, or rebooting. At this point your OSX systems should be able to discover the new time-capsule provider on the network and DTRT. tcpdump is an important tool for any system or network administrator, it is not just for security. It is often the best way to figure out why the network is not behaving as expected. It’s fairly short / concise, so I felt it would be good to read in its entirety. roff and promised to give it line-numbering capability the next day. department got its own machine. possible to use it to produce scripts in large type. Of course it was. for the final copy of a speech–was not onerous. aware of it, the hoard came to include minutes of AT&T board meetings. office bought a Unix system. users converted to Unix for trivial reasons: line numbers and vanity. Everybody loves easter-eggs, and today we have some fun odd ones from the history throughout UNIX told by Dennis Ritchie. Like most of the messages recorded in these compilations, this one was produced in some situation that we considered unlikely or as result of abuse; the details don’t matter. I’m recording why the phrase was selected. values of b may give rise to dom! It was of course obvious that the typist had interrupted a printout (generating the “!” from the ed editor) and moved up the paper, and that the context must have been something like “varying values of beta may give rise to domain wall movement” or some other fragment of a physically plausible patent application. At the same time, we were experimenting with text-to-voice software by Doug McIlroy and others, and of course the phrase was tried out with it. For whatever reason, its rendition of “give rise to dom!” accented the last word in a way that emphasized the phonetic similarity between “doom” and the first syllable of “dominance.” It pronounced “beta” in the British style, “beeta.” The entire occurrence became a small, shared treasure. The phrase had to be recorded somewhere, and it was, in the v6 source. Most likely it was Bob Morris who did the deed, but it could just as easily have been Ken. I hope that your browser reproduces the b as a Greek beta. I’ve even been given two sweatshirts that quote it. It’s often quoted as a slur on the quantity or quality of the comments in the Bell Labs research releases of Unix. Not an unfair observation in general, I fear, but in this case unjustified. So we tried to explain what was going on. “You are not expected to understand this” was intended as a remark in the spirit of “This won’t be on the exam,” rather than as an impudent challenge. There’s a few other interesting stories as well, if the odd/fun side of UNIX history at all interests you, I would recommend checking it out.